Back to school is typically associated with buying new school clothes and supplies only because we’ve been sucked in by a mass marketing system. The further we get pulled the more we believe and want rather then simply spending money because it’s a need. As soon as August rolls around the Back to School deals start showing up in the local flyers and media because they want parents to get ready ahead of time. With many families struggling to get ahead financially spending a fortune on school clothes is just out of the question. Then again you might be a parent who buys a new wardrobe year after year to go to work. Why is there this need to always wear something new or different? I’m pretty sure most people spend their time worrying about other things rather than what John or Suzie wore to work. Maybe clothing is the next step up the career ladder and if Suzie dresses better than Sarah she’s a shoe-in. Sounds daft BUT this really does happen. We put too much emphasis on what people wear rather than what their skills and experience entail. Parents are also influenced by their school experiences growing up. If a parent was picked on because they had weird hair then they make sure their child has a stylish cut at all times. Pauline’s mom was bullied because her shoes had holes in them so she makes sure her daughter always has the best quality shoes. Everything influences us but if you don’t want to buy new buy old and crush this out of control Back to School financial dump most parents face. It can be the most exciting time for parents and financially devastating if they aren’t prepared and have a clear path of what is a need and want. Back to school shopping deals are in full swing and we’re seeing prices get far more expensive even for the modest budget. What I don’t understand is why parents buy into this “Need for New Stuff” trend that has gone on for donkeys years. 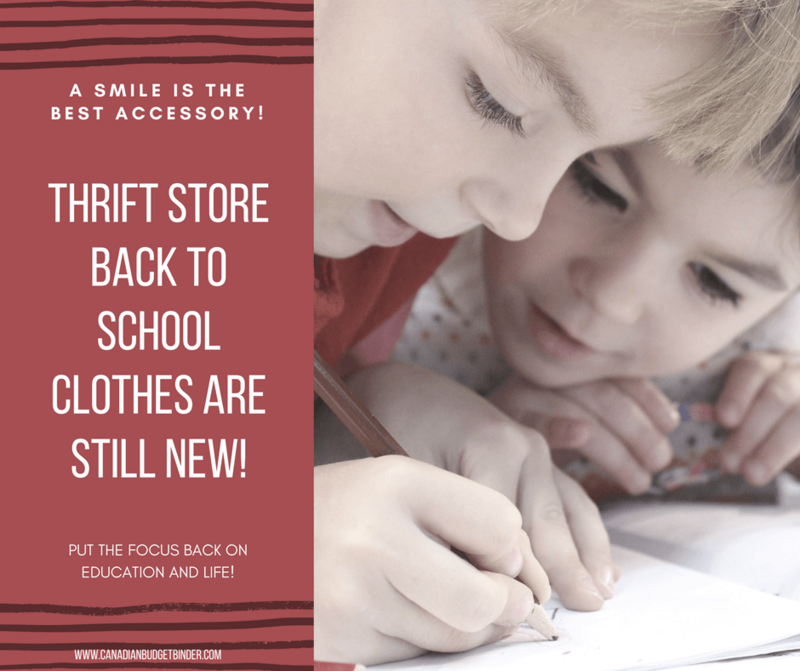 Do all kids really need a new wardrobe to head back to class in September? Probably not. Many kids fit into their clothes for longer than 12 months and if washed and handled properly could last even longer. Related: Should basic money skills be taught in school? I’m sure parents don’t want to whip out a cart of cash for new school clothes when kids often lose them, forget them, stain them and generally don’t take the best care of what they have. Enter the teenage room with clothes EVERYWHERE. When parents wash clothes that is the last-ditch effort to make them last longer and get the most out of their financial investment. If not, you’ll be buying new school clothes every year for your child. Related: Second-Hand Clothes from the Thrift Store- Are they worth it? 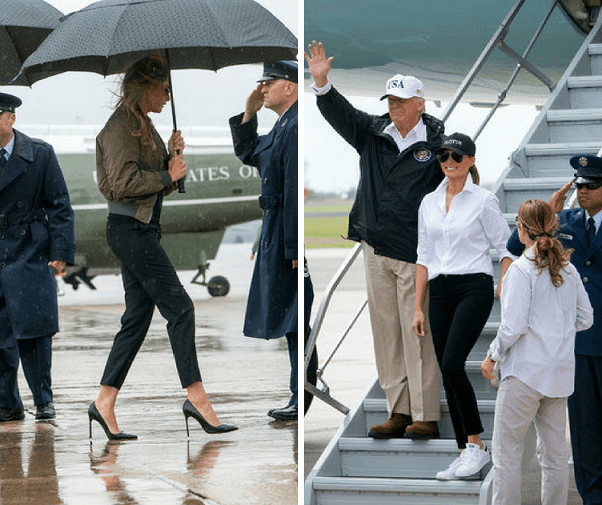 Look at what happened recently when Donald Trump and his wife Melania showed up to Texas where she was wearing high-heel shoes. A media frenzy happened because she should have dressed down for the Harvey disaster relief visit. She does the following day with a ball cap, pants and runners. Why? Because the masses told her to. She was influenced even though she probably wanted to wear high heels. It’s not as if she was going to do any of the clean-up and relief but out of respect for the devastation this was expected. Her shoes had no bearing on her visit, we made it that way. This is just an example how influence and judgement can alter the way we think about who we are, what we wear and the way we present ourselves. This all starts when we are young. Her shoes aren’t going to influence the empathy she has for the disaster. To be honest if you look at the photos the only difference is that she is wearing runners and a ball cap. Who cares? It was all about those shoes when the focus should have been on Harvey Disaster Relief. My point is our focus is often taken away from real issues. One of our friends who has a child returning to elementary school next week in grade 8 spent $800 on back to school clothes for her. Yes, Mrs. CBB and I both kind of nodded our heads and cranked our neck around BUT this is not uncommon especially for parents who have money to burn or something to prove. I often wonder if parents go out of their way to buy the best school clothes and accessories just to make sure that their kids hang out with the in-crowd and are not bullied in school. That’s a steep price to pay for something that should never happen in the first place. Again, media will always be an influence for boys and girls, men and women because we want to wear what the stars are wearing or a certain look is trending. It doesn’t matter if there is money available or not it’s a WANT rather than a NEED. Sometimes this can get you into big trouble. I can tell you from experience being the guy who didn’t care about fancy clothes, stuff and looking ‘cool’ for the girls that my time was best spent learning and getting the hell out of school. I made friends along the way but my focus wasn’t simply playing video games all day with my mates. I wanted more because my parents motivated me in that direction. Being taught that buying something with money deemed used was actually new because I had never owned it before was actually a smart move from my parents. The product may not be in brand new condition but works and functions as it should so it’s new enough. The same went for buying after school clothes since I wore a school uniform. Living in the UK we wore what would be considered in Canada the ‘Catholic school uniform’ and they still do. Back to school uniforms don’t always have to be purchased brand new either because there are countless parents and teenagers hoping to sell what they’ve already grown out of. The typical school girl uniform in the UK is the same as the school boy uniform, pants, blazer, tie and a white dress shirt. That’s it. It’s not always about the price of style of the clothes is about uniformity where everyone looks the same. This then lessens one form of worry for parents who can’t afford fancy clothes and those kids who think it’s ok to bully others based on what parents can and can’t afford. For example, John’s parents bought him a new bike and it cost $1000 where Ian’s parents bought him a new bike from the Thrift Store for $20. Don’t you worry, the rich run with the rich even when kids are young based on what they believe their parents have or don’t have. This means if kids live in a big house, parents have good jobs and they get what they want these types of kids are out of reach for the budget-family kids who don’t get everything. In speaking with my niece who is overweight for her age and has mild autism she says that she rather enjoys the uniform because the focus is on the person rather than trends. This is coming from a 12-year-old girl who knows she’s different but very smart and sometimes worries about being bullied. So far, she’s doing well because she is a strong girl but even we know that hiding behind emotions can be easy to do. My parents will be a thrifty couple for life and even when we made our recent trip back to the UK we toured almost every second-hand shop that we could in the areas we visited. Teaching our son from a young age that shopping at the Thrift store or even garage sales or other media outlets is posh because you can buy stuff for less that you wouldn’t otherwise buy at full price or even sale price. Overall, a back to school budget should include some old items as well as new based on need rather than want. The mindset of a child starts from a very young age and it’s up to us parents to show them the way and hope they take the right path. Money doesn’t buy happiness, smiles do because they are the best accessory even if your back to school clothes are thrift bargains. Discussion Question: What can you buy kids at the Thrift store that they can reuse year after year at school?